This new black hole theory is based on the local horizon repulsion effect of new black holes on real spinning fermions and as a consequence: decresasing entropy. Electron jets originated by two or more dumbbell black holes. Is Solar Power, Internal or External? Dark matter is made up by different sized black holes , Dark energy is the superdense oscillating Higgs space . 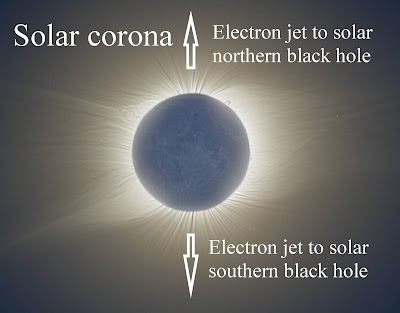 Evidence for the existence of Solar polar electron jets, an indication for a double set of Solar Anchor Black Holes ( dark matter). Dark matter is proving less shadowy than its name suggests. Its signature may have been detected by a balloon-borne experiment that measured a surprisingly high number of energetic electrons streaming in from space. There must be another source relatively near us that is producing these additional particles." According to the research, this source would need to be within about 3,000 light years of the sun. It could be an exotic object such as a pulsar, mini-quasar, supernova remnant or an intermediate mass black hole. According to the Higgs-multiverse model descibed in my book, Dark flow should be seen as a clear sign of the CONTRACTION of the MULTIVERSE instead of an EXPANDING ACCELLERATING universe. C: Fermionic matter originated at the Fermion repulsive horizon of black holes. Pffff you will say, this is all too much at once for me. The peculiar NEW God (Higgs) particle and the resulting NEW Black hole. Based on particle decay research described in this blog, there is strong evidence that elementary particles are NOT pointlike as mainstream physics assumes. In contrast, elementary particles seem to have a complex curved shape able to change form and make compound Quarks and Leptons after collision with the Higgs vacuum particles also coined God particles. Fermions (such as electrons, positrons and Quarks) seem to have even a real PROPELLER shape with a left- or right-handed pitch. Fermions seem to be forced to “FLIP their spin state” at some crucial distance from Black hole nuclei and form gas tails, able to migrate Black holes through the Higgs vacuum. By this process, Black holes of different sizes seem to be forced to SPLIT and PAIR into dumbbell systems with gas concentration in the middle to form galaxies or stars. 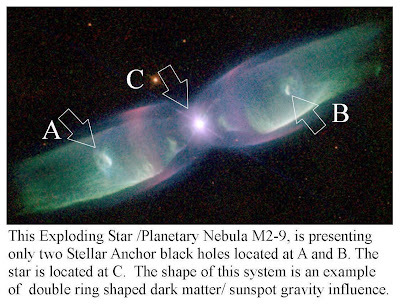 As a result every planet related star should have at least TWO Stellar anchor Black holes, just like Galaxies. 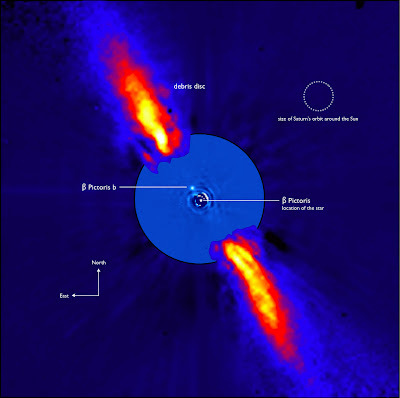 These Black holes become visible as “Hotspots” after gas ejection away from the star. 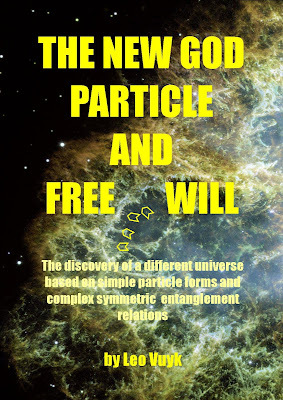 See also my book BASED ON SMALL ANOMALOUS astronomical/physical FACTS coined: THE NEW GOD PARTICLE and FREE WILL. The discovery of a different universe based on simple particle forms and complex symmetric entanglement relation. 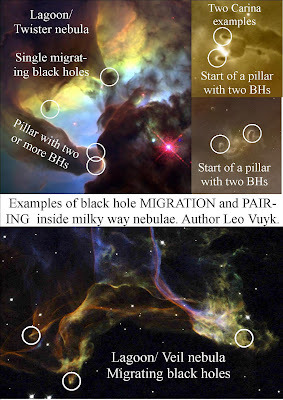 Hubble telescope images of the different forms of star formation and the shapes of so called “Gas pillars” inside the star forming nebulae of the Milky-way galaxy, tell us the story of splitting and Pairing NEW Black holes. One of the new results: Massless Black hole propulsion and repelling by gas tails. Splitting black holes become Pairing black holes which repel each other to form Herbig Haro objects with newborn stars in between.. The principle of black hole propulsion can be described as the propulsion of single black holes by gas tails, which are deforming the black hole horizon and the Higgs vacuum lattice structure into an anti-symmetrical oscillating shape. Due to this deformation effect, the black hole nucleus itself is propelled by the local anti-symmetrical oscillating Higgs vacuum. 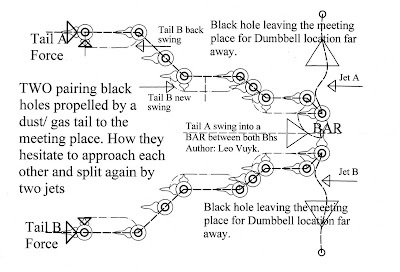 The Pairing of black holes can be described as the result of alternating tail swing which is influenced by the mutual black hole gravitation effect. 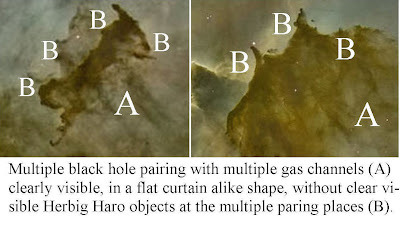 At the end, a Herbig Haro object is often observed with two more or less linear jets ending into two hotspots. 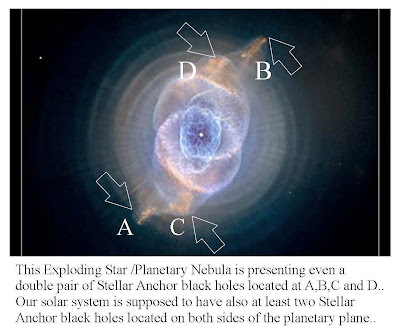 ( the two black holes became to rest) See below. Higgs-Graviton Quantum Gravity etc. etc. Is Less More in the Symmetric Multiverse? If the second Law of Thermodynamics is violated by entropy decrease, near Fermion friendly "NEW Black Holes", which seem to be the case inside the TADPOLE and other Carina objects, THEN the description of unexplained energized x-ray point sources, such as all AGN-Quasar Hotspots, Sunspots, Herbig Haro Hotspots, Comets and Ball Lightning, should be one of the highest scientific and economic goals. If we learn about how the universe is able to use this Fermion friendly "NEW black hole" energy, then perhaps we can copy it on Earth. Carina nebula, a Playground for pairing Black holes. 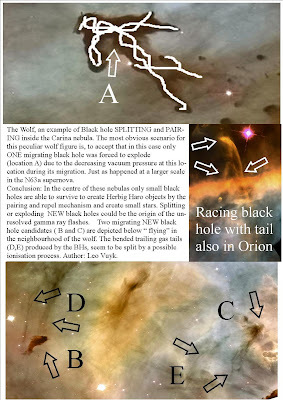 What future comparison between old and newer Carina images will show . Gas pillar regions in the Carina nebula are well known cradles of open star clusters, but they seem to be produced by pairing massless "NEW" black holes. However according to the images, there are multiple ways for these black holes to meet each other. 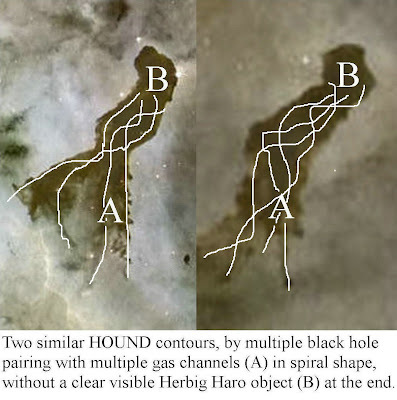 Herbig Haro hotspots seem to be only temporal manifestations of the end of the pairing black hole journey. How could we explain massless black holes? It is a relative simple picture, its about pushing gravity. Just imagine that the vacuum is a ultra dense energetic oscillating lattice of REAL Higgs particles , which are able to transport photon information like graviton-, electric,- magnetic and etc.etc along the lattice. Fermions are REAL propeller shaped entities spinning outside this lattice but energized and driven to spin , by the continuous scattering with these Higgs particles. Each collision with a Fermion does change one real Higgs particles program into a Higgs particle with a particular photon quality depending on the angle of scattering attack of the Higgs to the Fermion. Thus the spin and "eigen energy" of the Fermion has come from the Higgs field. Black holes are supposed to be particle graveyards with a real particle nucleus, densely packed together by the Higgs pressure from outside, not able to emit graviton information outside the horizon, because the Higgs lattice is eaten by the black hole, due to a constant Casimir effect. If Black holes do not emit photon information like gravitons, then they have NO MASS, nothing (no Fermions) is spinning inside the nucleus. As a result we may formulate things different. This is a rough version! MASS is the variable (Lorentz-transformed) capacity of real spinning Fermions, to change real oscillating Higgs particles into as much Graviton particles. MOTION, is the (Lorentz-transformed) capacity of real spinning Fermions, to change oscillating Higgs particles into as much Gravitons in all directions and in equal numbers around the Fermion. ACCELERATION, is the (Lorentz-transformed) capacity of real spinning Fermions, to change oscillating Higgs particles into as much Gravitons in all directions but in NON-equal numbers around the Fermion, leading to a non globular impulse vector field around the Fermion. GRAVITY, is the balancing result between the impulse differences of Higgs and Graviton scattering on spinning Fermions. If represented as a non-globular impulse vector field around the Fermion we could call this a Gravity Hedgehog. New massless Black holes seem to be Fermion repelling and Higgs vacuum eating objects at all scales, down to sunspots and ball lightning, able to form pairs with matter concentration in between. Planetary nebula with paired black holes. There is something knotty in the Helix nebula. Plato’s allegory of the cave is still to date. We humans live in a dark cave with only a little light information coming from outside to make still guesses about the real world and our destiny. 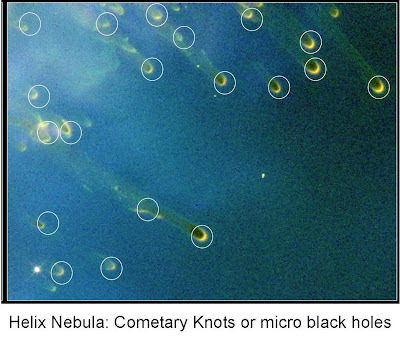 KNOTTY dark matter sources of the Helix nebula represent the former “sunspots” of the former star, they seem to be less able to get in motion by the explosion of the star than normal atomic material. This is in line with the new black hole model. 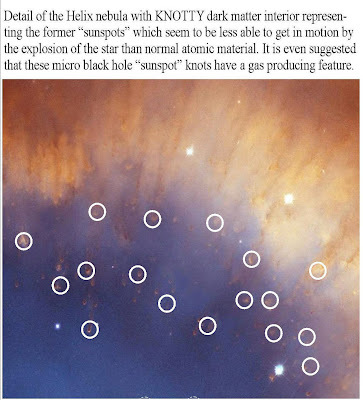 It is even suggested that these knotty micro black hole “sunspots” have a gas producing feature. should have be found by the MACHO (Massive astrophysical compact halo object) project team, cause by the expected gravitational lensing effects around the paired Solar polar located black holes. I was highly pleased and amused to find a clear indication of at least one anomalous MACHO lensing effect located at l-b= 3.11-3.01! Microlensing Optical Depth towards the Galactic Bulge Using Clump Giants from the MACHO Survey. P. Popowski1, K. Griest2, et all. “The forms and features of the new GOD Particle introduce “New Physics” and as the ultimate consequence a new interpretation of Free Will and Free Energy. 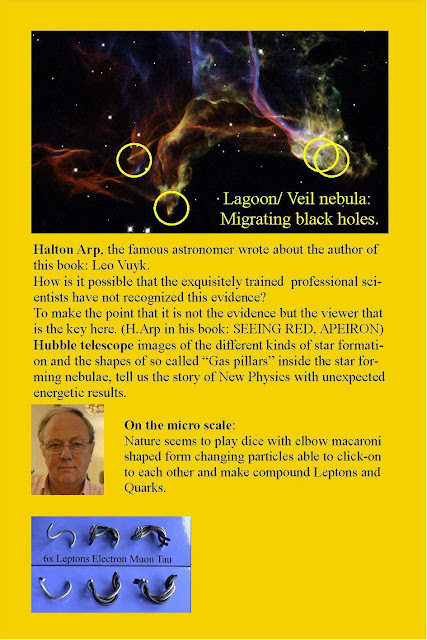 It was the famous astronomer Halton Arp of the Max Planck institute at Gaerching/Muenchen who stimulated me to do extensive research on physics and astronomy by his positive qualification on my research, in his book: “Seeing Red” published by. Apeiron Montreal 1998. So, yes I am an amateur in physics and astronomy, I have a masters degree in architecture and building engineering, ( TU Delft 1972) highly interested in large and small scale structure formation of spaces, from social housing up to university hospitals, but I was in addition able to do incidental research at the university of Utrecht at the physics and astronomy department. In the beginning, I focussed myself on the formation and shapes of astronomical structures at different scales. 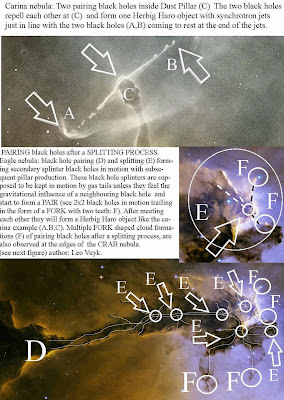 I found out, that from the smallest Herbig Haro structures to the largest Galaxy clusters so called pairing dumbbell patterns can be observed, which in my view could introduce crucial implications for dark matter. This was leading to a new interpretation of black holes and dark energy. However, this was also the origin of new ideas on the microscopic scale, leading to the proposal for a new energetic oscillating entangled Higgs vacuum with the oscillating Higgs particle inside. The until now by experiment unresolved Higgs particle is generally called the “God Particle”. Halton Arp’s book was published in 1998, ten years separated from this book, which describes the results of what I in addition was able to “construct” out of this new vision on dark matter and dark energy. A second firm help to do research for this book is also found inside the essays called “Speakable and unspeakable in quantum mechanis” made by John Steward Bell (1928-1990), especially those essays which are related to his “Bell theorem” and the so called “Broglie-Bohm theory”. It is my conviction that the new physics solutions presented in this book, are only a small step beyond the Bell/Bohm interpretation of quantum mechanics described in his essays. My proposal for a new double Stern Gerlach experiment to prove the existence of a local multi-particle entanglement between silver atoms, is the proof of this statement. It should have been very easy for John Bell to proposed this experiment by himself, because all the theoretical ingredients where there at that moment. The NEW vacuum is filled up with a super dense triangular shaped lattice structure of energetic oscillating and scattering Higgs particles able to give Fermions their "eigen energy" and able to transmit photon particle information along the chiral vacuum lattice lines. Particles (Fermions and Bosons) are real shaped particles with a definite Form instead of wave-functions, all these shapes are originated from the variable shape of the Higgs-vacuum particles. All particles are supposed to be guided continuously by so called “entanglement at a distance” acting between their copy partners located at a small distance inside the experimental setting (as a form of non-local hidden variable) AND at a large distance between copy anti-universes. As long as there are only two correlated particles to measure, we may not speak of a so called “non-local hidden variable” situation, because there is no hidden polarisation relation with other particles, as is proposed to act inside a normal Stern Gerlach experiment. A NEW cyclic symmetrical “raspberry shaped” Big Bang proposal is described as the evaporation in stages of a central Big Crunch black hole. All NEW black holes of different sizes, are the only origin of dark matter, they seem to be able to repel fermions from its horizon leaving hydrogen clouds behind as is visible at merging Galaxies such as Cygnus-A dual hotspots. The NEW energetic oscillating Higgs vacuum lattice is assumed to be the origin of all dark energy effects and able to MIMIC relativity rules, down to a measurable scale. It introduces a new kind of measurable preferred vacuum reference frame dubbed “Local Anti-Symmetrical Oscillating vacuum Frame” (LASOF). Consequently it looks as if Mainstream physics has been looking for clues of reality way beyond reality; however it is obvious that there was a firm reason to do so. Only small anomalies measured outside this Earth can tell us the real truth about what is really happening outside the cave (called earth) we are sitting in, like Plato already mentioned. Plato’s allegory of the cave is still actual. We humans live in a dark cave with only a little light information coming from outside, to make continuous guesses about the real world and our destiny. This book is an attempt to shed some alternative light into the cave based on small anomalies found outside this world. The new God particle and the second Law. The different forms of Gas pillars and star formation inside Milky tell us the story of a New Physics. 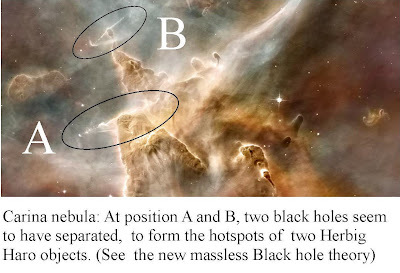 If the second Law of Thermodynamics is violated near "NEW Black Holes", then this is a sign of new physics and at the same time the description of unexplained energized x-ray point sources, such as all Quasar Hotspots, Sunspots, Herbig Haro Hotspots, Comets and Ball Lightning, should become possible. 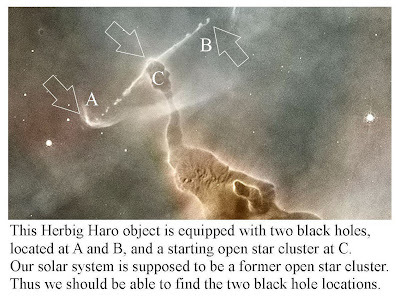 If we look at the Carina Nebula, we may become a strong suspicion for such phenomena, by recognizing pairing black holes as the base for new Herbig Haro objects which are known as the origin of new open star clusters. However we need to find the mechanism behind these pairing black holes, which could be found by a new interpretation of the Higgs based vacuum. Only if we assume that the Higgs vacuum is a dense network or lattice occupied by fast oscillating FORM changing Higgs particles and that Fermions are real spinning propeller shaped particles able to make a SPIN-FLIP at the Black hole horizon and repel from it. Then we may have a logical foundation for violation of thermodynamics at the black hole horizon. However, in that case, the vacuum is supposed to be a super dense God particle based particle system with a memory for speed and position of particles. Can we find support for such a weird proposal in the history of physics? It was David Bohm and John Bell and others, like Jean Pierre Vigier and Basil Hiley, who tried to get an alternative picture and a more ontological sound proposal for physical reality. However they failed to propose experimental differences with the standard theory to get a broad support from the physics community and the mathematical changes they proposed where not seen by the mainstream as a better alternative. This is also described by Paul Davies and John Brown in “The Ghost in the atom” described later in this book. In my book however I will explain and describe several useful experiments to do the job to create a foundation for such a real alternative. That is to say, to understand those new experiments, we have to change our understanding of reality by descending down to the smallest microstructures such as the electron and the positron and we have to go up to the largest scale: the universe as a whole including the Big bang. We will observe that the guiding system for particles we need just like David Bohm proposed (The Pilot wave) but did not find, should be about the same system as the guiding system for our free choices and free will. This guiding system I dubbed: Multi-universal entanglement between anti-material universes located inside the raspberry shaped multiverse. The brush of an artist is freely guided over the canvas while painting. We say the artist guides his brush in full freedom because he uses his free will to do so. We also may say that historical events like wars or military interference are based on free will of the responsible presidents or responsible decision makers. But is this really the case? What we see, is the different morality of these two examples. In this book I will try to give an answer to the question of free will, based on rigorous causal reasoning and my new model of the world around us, which is made falsifiable and testable by a handful of future- but also by historical experiments already. That new model is based on the unusual but most simple hypothesis for a new kind of Big Bang, together with the assumption, that our universe is STILL fully symmetric from the start in the form of a raspberry shaped multi universe, the "multiverse". The Big Bang should be interpreted as the Fractal evaporation of a Big Crunch black hole, into an even set of symmetric and EPR related bubbles of copy universes. As a result, we live in a material bubble of the symmetric raspberry multiverse which is without time delay "entangled at a long distance" with the other (anti)-material copy bubbles. "EPR related" means that the particle system is based on the results of recent laboratory experiments originally based on the ideas of Einstein Podolski and Rosen (EPR). The EPR experiments demonstrated that particles that shared originally the same "identical state" remain instantly and enduringly connected, even at long distances like universal scales. As a start I give here some thoughts of other thinkers about free will, also with a clear difference on morality impact. I can do what I will: I can, if I will, give everything I have to the poor and thus become poor myself — if I will! But I cannot will this, because the opposing motives have much too much power over me for me to be able to. On the other hand, if I had a different character, even to the extent that I were a saint, then I would be able to will it. But then I could not keep from willing it, and hence I would have to do so. The Rene Descartes idea: Cogito ergo sum: I think therefore I am. To lift a tip of the solution described in this book, I would say beforehand, that the physics of the universe seem to have the possibility of moral aspects in itself. This hypothesis is in line with other thinkers like Teilhard de Chardin (Noösphere, global consciousness) and Frank Tipler, who both predicted that all historical and actual information about our world is stored somewhere in the vacuum around the Earth, however my physical underpinning is quite different. My own conviction about this subject is that the vacuum of the universe has a much more dense unresolved microscopic structure then mainstream physics wants to accept at this moment. This vacuum structure is supposed to be able to store, like a digital RAM -read and address memory-, all our individual thoughts ideas and actions. More in detail: It is as if the Earth as a whole makes backup copies of itself every split second and leave these copies behind in the form of a ring around the Sun. We humans seem to be able to tap information (backwards) out of this digital memory. More consequently, we are “forced” to constantly tap information out of this vacuum system, in the form of our dreams, creative intuition and even partly our human urges. Our social and moral behavior and habits are supposed to be influenced by this memory and as a consequence, the completion of this memory with its own Earth bound morality (good or bad) could be the ultimate goal of humanity as a local part of a much larger universal whole. As a result, it is the base for our personal IDENTITY and perhaps even the origin for a scientific based astrology in the future, if the ring structure around the sun of this cosmic vacuum memory could be observed by scientific experiments. I am very pleased about recent (2007) laboratory results found by Marcel Brass ( Gent) and Patrick Haggard (London) , which do confirm the well known work of Benjamin Libet on free will and his brain research on so called motor reaction times of subjects in the laboratory. These findings are also a strong refutation of the recent free will ideas of Daniel Dennett, who fiercely attacked Libet in his book “Freedom evolves” (2003). It looks as if our free will can only be described as “not doing” or aborting at the last possible moment our intentions, in full agreement with Benjamin Libet's proposal for free will. The Zen Buddhist philosophy of the importance of “not doing” will be also of interest here. Einstein as a child, tried to imagine how the world would look like from the position of a photon. If imagination is the motor of our changing interpretation of the world, then we should work on our imagination of the universe at all scales. Then the imaginative interpretation of the visual aspects of the Cosmos could be the base for real discrimination and order. If the collapse of the wavefunction is the only way for nature to make a choice then the explanation for human choices and FREE WILL should be related to wavefunction collapse. One of the most recent and accessible descriptions of the great problems of physics, inspired me to write this book because I boldly think I can shed some modest alternative light. It is called “the Trouble with Physics” written by Lee Smolin, a well known physicist. 1: Explain how all the particles and forces are manifestations of a single entity (the GOD particle) the unification of particles and forces. 2: How are the values chosen of the free constants in the standard model of particle physics. 3: Explain dark matter and dark energy. 4: Combine general relativity and quantum theory into a single theory that can claim to be the complete theory of nature, also called the quantum gravity problem. 5: Resolve the problems in the foundations of quantum mechanics either by making sense of the standing theory or invent a new one. To explain Free Will we also seem to need a new model of reality. So I hope you will enjoy reading this book, but I must apologize for the crash you could experience about your own personal SELF. The world seems to be split in two -or even more- interconnected “entangled” mirror symmetrical parts and you are only partly responsible for your decisions you make. However, as a consequence, You are not alone! We all are at a long distance direct related-in all our actions, dreams and thoughts- to our identical (anti-) counterparts at the other side of our universal bubble. Is there consequently nothing left of a single personal identity, who has a single possibility to choose and could be the guiding entity for the others? There is a small possibility yes, based on the existence of little deviations in the existing experiments made by Benjamin Libet and others. It is called "incidental pre-planning", which has got no scientific attention as far as I know. In a private letter, Benjamin Libet wrote that he was not able to reproduce the statistics of these incidental pre-planning events of his experiments, because they where "Buried" in his computer files. 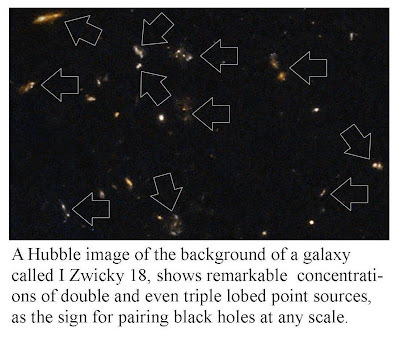 As a weird but logic consequence, this Libet experiment should be reproduced to find out about the percentages of "incidental preplanning" to be able to peculate about the number of entangled copy universes. Vacuum energy is supposed by mainstream physics to be energy exists in space even when devoid of matter. This vacuum energy is supposed to be the origin of all the fundamental forces, the electromagnetic- strong- weak- and gravity forces. It is found to be present in experiments like the spontaneous emission of light or gamma radiation, the , Van der Waals bonds, Casimir effect, the Lamb shift, etc; and in this book it is thought to have consequences for the behavior of the “symmetrical entangled” Universe on cosmological scales. In this book I support the idea that the vacuum is able to produce this vacuum energy by the autonomous oscillation of densely tetrahedral shaped system (lattice) of Higgs particles. These Higgs particles are supposed to be the origin of all other particles (the God particle) by a simple change of their rigid FORM. Thus Fermions have also real rigid forms and are supposed to have a propeller shape to become spin by Higgs scattering coming in from all directions. If the Higgs oscillations have a random globular impulse on a fermion, we may conclude that the fermion is in equilibrium with the Higgs vacuum in free space and if each impact is represented by one Higgs vector we may speak of a so symmetrical Higgs impulse vector Hedgehog (IVH). If this vector Hedgehog is anti-symmetrical, the fermion may have an absolute motion through the vacuum, (Lorentz polarization) or the fermion is accelerated by a fundamental force like gravity! At the borders of a black hole these fermions seem to have an opposite reaction to the Higgs impact hedgehog. As a result fermions are not able to enter the horizon of a black hole. As a consequence ENTROPY is decreasing around the horizon of a black hole and the universe is served with Free Energy, or a "lage scale Casimir effect", the origin of all non-Newtonian complexity in the universe like Cygnus A, ( see below) the origin of so called dark energy effects and perhaps even an alternative energy source on earth!